You are here: Home / About Soccer Psychology / Are You Weak if You Use a Sports Psychologist? Are You Weak if You Use a Sports Psychologist? Many players have a fear that other athletes or teammates will see them as weak if they work with a sports psychologist for soccer. Are you or any of your athletes hesitant about mental training? Myths about sports psychology can prevent athletes from developing a strong mental game. Even though sports psychology has become more widely accepted, particularly with professional soccer players, some myths still remain about working with a sports psychologist for soccer. Many club and collegiate soccer players are unaware that almost all professional athletes seek mental training. We’re surprised that people still view mental training or sports psychology as a weakness and thus think they are inferior because they need to do mental training. 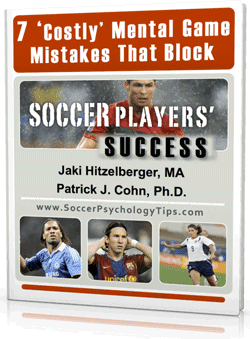 Unfortunately, a few athletes still buy into myths about soccer psychology and thus shy away. This is a misguided conception about the value of using a sports psychologist for soccer. Why do professional athletes believe in mental training? One of the hallmarks of great athletes is their interest in improving themselves. That doesn’t just apply to their physical skills; it applies to their mental game, as well. There’s nothing weak or wimpy about wanting to improve oneself and one’s performance. Your desire to improve both your physical AND your mental game shows your commitment to becoming a better soccer player. As soccer psychology becomes more well known, athletes at all levels are using mental training and sports psychology to become better athletes–no matter if they are in a slump or trying to keep a winning streak alive. Many professional athletes talk publicly about their use of sports psychology including former US Women’s National Team player Mia Hamm. Mia says that mental toughness is essential for success. Soccer players are more likely to embrace mental training and work with a sports psychologist when they understand it and how it can help. However, the best way for athletes to buy into mental training is when they actually experience its power firsthand. Sports psychology or mental training helps athletes perform under pressure, block out distractions, focus on execution, stay in the zone, and many more mental game elements that are essential for success in soccer.